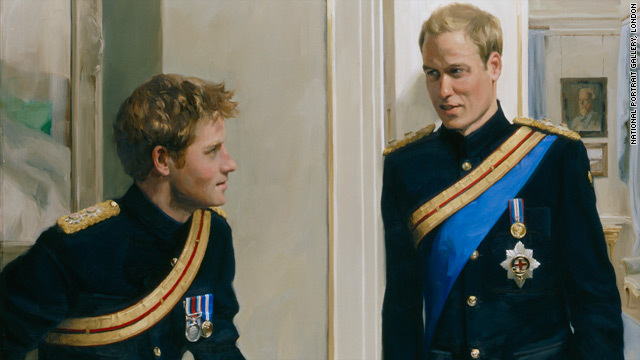 Artist Nicky Philipps captured an informal moment between Britain's Princes William and Harry which is on display at London's National Portrait Gallery. London, England (CNN) -- The first double portrait of Britain's Princes William and Harry went on display Tuesday at the National Portrait Gallery. The painting shows the brothers dressed in their military uniforms, chatting to each other at their home at Clarence House, near Buckingham Palace. It is the first portrait to show William and Harry together, the National Portrait Gallery said. It will now hang in the museum alongside other portraits of the royal family. Artist Nicky Philipps said she was able to capture an informal moment, "a behind-the-scenes glance at the human element of royal responsibility, and to emphasize their brotherly relationship." Commissioned by the National Portrait Gallery, the painting shows Prince Harry seated next to Prince William, who is standing to his left. They are wearing the dress uniform of the Blues and Royals regiment of the Household Cavalry, where they are both lieutenants. William also wears the the star and blue sash of the Order of the Garter, a British order of chivalry, which the queen awarded him in 2008. William, 27, is now training to be a search-and-rescue pilot with the Royal Air Force, where he holds the rank of flight lieutenant. Harry, 25, who served in Afghanistan, is training to become a pilot with the Army Air Corps. "The first portrait of the princes captures them formally dressed, but informally posed," said Sandy Nairne, the museum's director. "It is a delightful image which extends the tradition of royal portraiture." The National Portrait Gallery said it was appropriate that the princes were pictured at Clarence House, which used to be the home of the late Queen Mother. Part of a painting of the Queen Mother is visible above Harry's shoulder in the portrait, and paintings from her private collection are seen behind William. Philipps, 45, has had high-profile commissions before, but said it was a "great privilege" to paint the two princes. "They were very good company and although I was commissioned to paint them in their official context, I hope I have also captured some of the brotherly banter that characterized the sittings," she said.